The weekly Zealous Good report is out and in a few short months we have matched $18,195 in goods and services to our much deserving and unrelentingly awesome partner organizations! That fistful of dollars came in many shapes and sizes, from a washer and dryer to bicycles for youth, diapers to professional organizing services, and so many things in between. Turns out, $18,195 can go pretty far. It’s extremely easy to lose sight of the actual value of a number tossed out into the atmosphere. We are constantly reminded of our trillion dollar wars and ten dollar words, reading about the thousands of dollars that celebrities spend on shoes or the insane amount of money exchanged across worldwide markets every day. It’s a touch desensitizing, isn’t it? So how about a bit of perspective on the value of the number 18,195? Tell me your secrets, tiny car. Purchase lunch for over 45,000 CPS students. Circle the earth up to 6 times. Pay 4 Latvian nurses’ annual salaries. 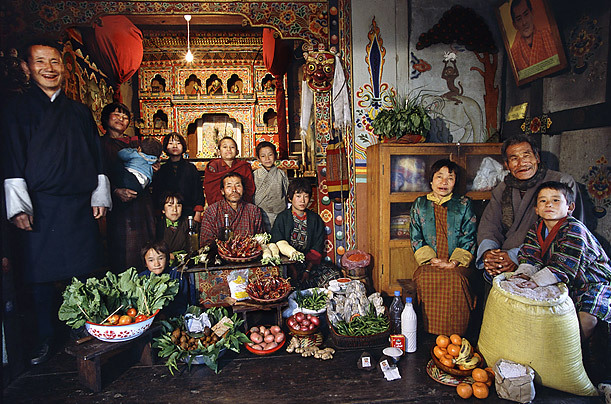 Feed all 11 members of the Namgay family (of the Shingkhey Village Namgays) in Bhutan for almost 10 years. From Peter Menzel’s excellent book, Hungry Planet, featured in Time Magazine. Yessir, $18,195 is nothing to sneeze at – those pennies can certainly travel quite a ways and make a not insignificant impact on some human beings’ lives. That the money came to us in tangible and necessary forms, as items that families and organizations in our own neighborhoods truly need, makes the number all the more real and important to us. What’s more is that behind that number stand our friends and supporters, people who are passionate about people and community, who give what they can when they can. Can’t put a dollar sign on that. As we continue to develop our community and connect with more organizations and potential donors, let’s be sure to keep every day, every dollar, and every ounce of support in perspective. Keep us humble. Keep us good. Next Post LinkedIn Wants to Know You Better. I do too.